I always have a smile on my face when I think about Venice. Beeing surrounded by breathtaking ancient buildings, blue canals and countless bridges which create a unique atmosphere is something special. Even though Venice seems to be overrun with tourists, I´m always able find spots, bridges or squares wehre it feels like I have the city just for me. These are the moments to let your soul take a rest, to gain new energy and to soak up the beauty of the city. When you look to other cities it´s quite obvious that Venice isn´t as hectic as New York, as big as London or as modern as Singapore. It´s nothing but the maritime flair I like, may because I´m surrounded by water in my hometown Hamburg as well. For my last stay in Venice I decided to join a Free Tour, hoping to discover new sides of the city that stayed hidden to me until now. It turned out to be a good idea and so I found the Campo Santi Giovanni e Paolo and a small bridge not far from there. It´s always something special for me to sit down on these spots, waiting for the sunset to begin. To see the light of the setting sun over the blue water, getting reflected on the fronts of the ancient building, creates a scenery, similar to a painting by Tiziano Vecellio. 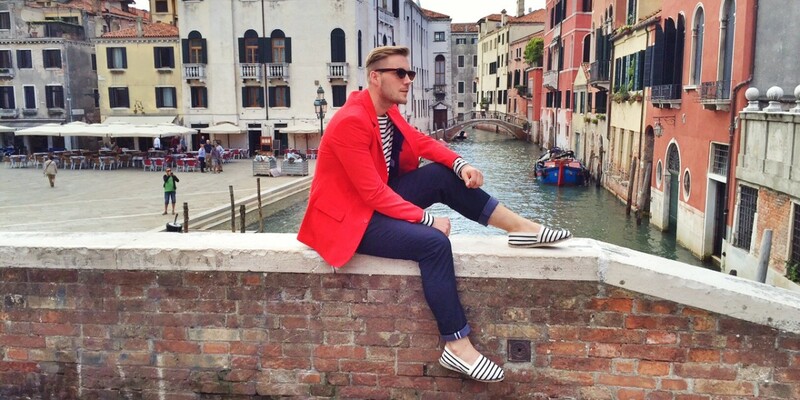 I decided to wear a red blazer and a striped shirt for this spectacular maritime backdrop. In combination with the striped Espadrij shoes it felt that the look was the perfect choice for the summerlike temperatures. Hi Martin, perfect look in Venice!!! You are perfect. I need to get to Venice this year. Merry Christmas to you, you lovely/handsome/beautiful man! I love you forever!